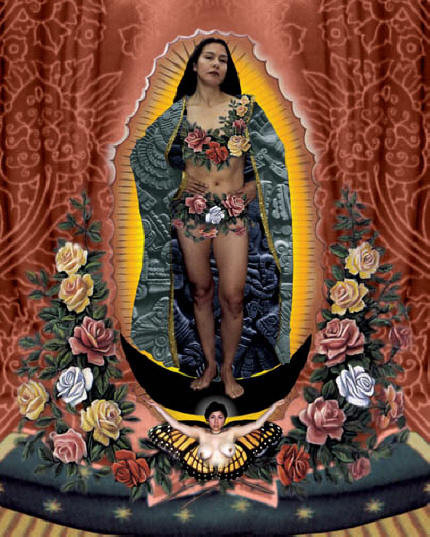 Is depicting Our Lady of Guadalupe (OLG) as a naked young women with roses covering her privates really art? It's creator, LA artist Alma Lopez seems to think so. As does the city museums that are exhibiting her work. As expected, many Catholics don't. A thousand gathered in front of Santa Fe's Museum of International Folk Art to express their outrage when it was on exhibit there. Continued objection led to its eventual censorship. Now that the piece is on display in Oakland Catholic activist groups in northern California are asking their brothers and sister in the south to join them in protest. One group, America Needs Fatima, is urging California Catholics to express their outrage by email, phone or letters. It's targeting at least 65,000 individual efforts in this current campaign. Objecting Catholics feel that Lopez's depiction of Our Lady of Guadalupe is sacrilegious, if not blasphemous, for someone considered the patron of the Americas. Time and time again, you hear statements like: "there are some places you don't go, and disrespect for a central figure of the Catholic Faith is one of them." Catholic bashing seems to becoming more and more commonplace in today's entertainment, art and media. Not long ago Lindsay Lohan donned the cover of a international fashion magazine, posing a as a crucified Christ, complete with stigmata. Jerry Springer-The Opera has more incidents of alleged blasphemy than you can count on one hand. Rick is a lifelong Catholic, and a product of Catholic education. He holds bachelor's and master's degrees from Michigan State's School of Communications. After a successful career in advertising and marketing management, he responded to Pope John Paul's call to evangelization and became active in the lay Catholic apostolate, helping to pioneer Basilica Press, Ascension Press, and Envoy, the award-winning Catholic apologetic magazine (of which he is a contributing writer.) He established one of the first Catholic information portals, www.goodcathinfo.com, back in the early 90s.